Sea Nymph was one of the oldest and most-respected brands of composite boats manufactured in NZ. However, increasing globalisation saw the brand temporarily disappear, before emerging under the new guise of Nereyda Boats. A joint venture company, with New Zealand management of quality control, upholstery and build supervision, the Sea Nymph moulds and tooling were taken over. However, the new company had its sights set on the global market and an existing US product meant that a new brand was needed. Nereyda is the Greek translation of Sea Nymph, so the link to the old brand has been maintained, while eliminating the potential for confusion in the market. A purpose-built 12,000m2 factory was built in Haimen, Jiangsu, on the northern side of the Shanghai River. This temperature and humidity-controlled facility now produces seven different models of trailer boat, from the 470 runabout to the 650 walk-around. The company hopes to soon grow its range to cater for the upper end of the market. The new manufacturing facility will be able to produce high-quality boats at a competitive price, with all the benefits of increased production volumes, while still producing well-finished hulls. Brokerage Marine was one of the first dealers appointed for the new Nereyda range and owner Gary Stephenson is excited about the brand. "Sea Nymph has a 40-year history in New Zealand and we are pleased to be able to represent these proven performers in the Auckland market as their exclusive dealers," he says. The first Nereyda-branded boat to arrive at Brokerage Marine is the 480 Sport. Based, of course, on the original Sea Nymph hull, the new boat will have a new-shape windscreen, cabin windows, upholstery, pedestal seats, steering and cabin hatch. Additional options will also be available, including a split bow rail, king and queen seating and colouredhull sides. The boat we had the chance to review had the optional canopy and came fitted with an Evindrude 90hp E-TEC two-stroke outboard. It also had a road cover – always useful to keep the elements out of the boat while towing. The boat will be supplied on a locally-built Hosking single-axle trailer built to local requirements, and at just 1100kg towing weight, is easily towed with a modest family car. At $39,995, this Nereyda is positioned squarely in the small family boat market and will also suit those starting out in boating. Despite being a very moderate size, with a hull length of just 4.80m, it has a lot of features, so we were keen to have a closer look. The first thing that was apparent was the good height of the canopy, with headroom to spare for six-footers. So many smaller vessels are hampered by barely adequate canopies, but this one is just right. Although the canopy is not a true bimini (the front is solid canvas, with no clears), there is still adequate windscreen height to see through, without having to unzip the front section. However, when extra visibility is required, the front flap can be unzipped and rolled out the way. With a total length of just 4.8m, the Nereyda has a surprising amount of space. The beam is a surprising 2.18m – considerably more than many of its rivals. This translates to wide cockpit space, as well as superior stability at rest, albeit at a slight penalty in weight and horsepower requirements. The forward cabin, while clearly only a day cabin with half-length bunks, has fully-upholstered squabs and carpet-lined walls and roof. A step-down means there is more headroom than might be expected. The forward hatch has lockable stays to hold itself open and standing up through the hatch gives a comfortable position for accessing the anchor. Neatly hidden away in a self-draining anchor well, with a lockable hatch cover and a solid stainless fairlead, including bollard with locking pin, the anchor is easy to set. The boat was supplied with a galvanised Danforth anchor and rode. There is no space for fitting an anchor winch, but on this size boat it is probably unnecessary. Mounted on pedestals, the helm seats are well upholstered units with armrests. The review boat's seats were not adjustable, but this feature will be standard in future models. A moulded footrest makes the helm position comfortable for both standing and sitting and the high canopy roof means there are no head-height issues. The review boat had not yet had any electronics fitted, so just the standard Evinride engine gauges with white dials occupied the dash. 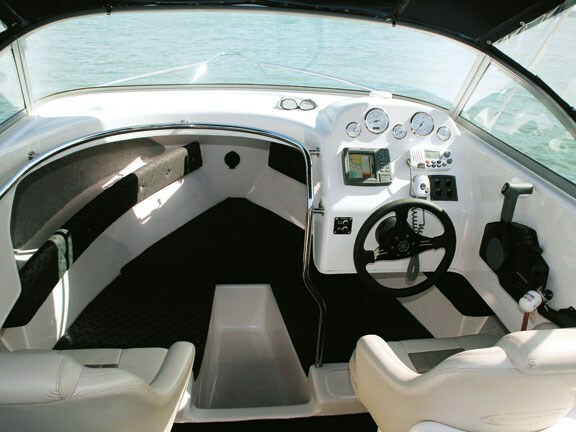 There is space for at least a seven-inch display in the dash for a chart plotter or fish finder and Brokerage Marine can fit this to the purchaser's specification. The passenger-side seat is identical to the helm seat, with a wrap-around stainless grab rail providing a convenient handhold. The cockpit is carpeted in a dark blue marine-grade carpet and a full-length wet bin runs under two hatches down the middle of the boat. Accommodated within the Nereyda 480 Sport are 25-litre tote tanks for fuel storage, while foam-filled compartments provide buoyancy under the floor down either side of the hull. The forward bunks have only a small storage area under each, with the remainder of the space in sealed compartments to provide additional reserve buoyancy. Set into the transom are two moulded seats on either side of the engine well and these have upholstered squabs clipped on. There is no door through the transom, but either seat can serve as a step to easily walk over the transom. The boarding platform is somewhat restricted, but a stainless boarding ladder on the starboard side makes for easy egress from the water for swimmers. Hanging out the back is that gleaming white 90hp Evinrude E-TEC two-stroke. 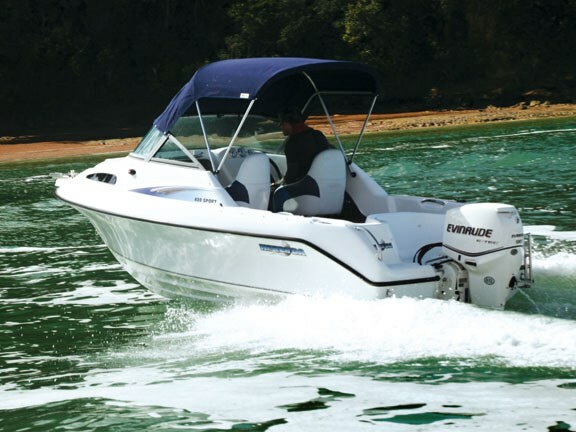 Brokerage Marine has recently added the Evinrude brand to its range of motor options and says that these efficient and light motors have proved popular. This motor is at the upper of end the recommended size for the hull, which is rated for 60 to 90hp. Two tote tanks are tucked neatly under the port-side transom, with space under the starboard side for one more alongside the battery. Pop-up flush cleats, as well as a stainless rod holder, are mounted to each gunwale at the rear and a nice touch is a recessed stainless grab handle, perfectly positioned for each of the rear seats. Meanwhile, a lined and padded storage shelf runs under each gunwale. It has to be said that the quality of finish of this Chinese-built boat is equal to that of most boats made in New Zealand – and arguably superior to some. Clearly the kiwi management and quality control is paying dividends and prospective buyers need have few fears about the quality of build. Spring was about to be sprung when we headed out from Westpark Marina with the little Nereyda. Conditions on the day were just about perfect, with no swell and almost no wind. 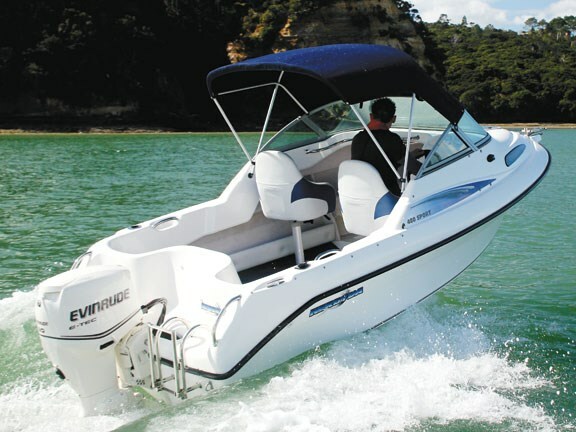 Once we were out in the restricted channel, we could open up and with only one person aboard, the Evinrude E-TEC easily pushed the hull to just above 30 knots. What is amazing is how comfortable the boat is at this speed – few sub-5m runabouts would have felt as good. Even at full throttle, the boat could be turned fairly tightly, with the planing strakes keeping everything controlled. It was hard to find any waves to test the rough-water capabilities of the Nereyda on the day, but certainly everything points to it being a safe and reliable performer, even in adverse conditions. The foam-filled hull plus the carpet lining makes for a quiet boat and it was hard not to draw comparisons with a couple of recent tests of similar-sized aluminium hulls. Although those were good boats in their own right, they cannot compare with the sense of quality and comfort that the Nereyda oozes. Admittedly that comfort does come at a price, both in the dollar value and the weight. As a result of the extra weight of the fibreglass hull (and the broader beam), a slightly larger motor is needed than the same size alloy boat would require, which again contributes to the higher cost of the complete package. But I defy any prospective purchaser to test this boat alongside an equivalent alloy model and not be impressed by the Nereyda. While at rest, the hull is extremely stable, thanks to both the very wide beam (for a boat of this size) and the weight of the hull, which causes it to settle comfortably. Despite this, it has stunning acceleration with the 90hp E-TEC and I can see no reason why a purchaser would want to settle for a smaller motor. The cockpit is a generous size, matching several boats with much longer hulls. The gunwales are not hugely high, but given that the Nereyda would not intentionally be taken out into extreme conditions, this would not be a concern. Overall, this is a very impressive boat. We did not get a chance to test it in adverse weather or fully laden with more than two adults on board, but it nevertheless looks to be solid and safe performer. 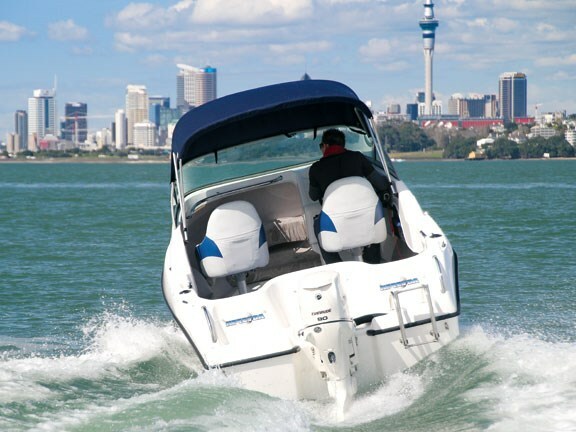 For more information contact Brokerage Marine, ph 0800 FUNAFLOAT or visit brokeragemarine.co.nz.